Another Grossfest 2019 guest announcement! For our next guest announcement, Glenn Berggoetz is the filmmaker behind twelve feature films, including the horror/thriller “Paralyzed with Fear” that stars Kane Hodder from the “Friday the 13th” films and “The Ghosts of Johnson Woods” that stars Joe Bob Briggs from “Monstervision.” Glenn makes most of his films on micro-budgets, which led to his being asked to write the book “The Independent Filmmaker’s Guide: Make Your Feature Film for $2,000,” which is available from the Hal Leonard Company. Glenn has also contributed numerous short horror films to the British “60 Seconds to Die” horror film anthologies. Next on his filmmaking agenda is the experimental horror film “Experiments in Evil” that he plans to shoot in the spring of 2019. With great excitement we introduce you to the talented Glenn Berggoetz! Check out http://www.grossfest.com. For our next announcement is possibly one of the most interesting independent filmmakers I have had the pleasure of meeting and his work is amazing. This person dabbles in all phases of filmmaking and has directed over 25 movies so far. This filmmaker has made a holiday film “Easter Casket” to something completely unusual in “Her Name Was Torment 1 and 2” to one of my favorite independent horror films of all time in “The Puppet Monster Massacre”. He is currently working on the film “Slaughterhouse Slumber Party”. It absolutely makes me ecstatic to introduce yinz to a multi-talented filmmaker in Dustin Wayde Mills! This dude is a producer and writer known for such films as “Intrusion 1 & 2” and also is in the independent film documentary “Blood on the Reel”. He is a busy dude always working on something independent and was originally from the Louisville, Kentucky area. But he recently moved to Michigan to continue his work in film and writing. It is awesome to introduce yinz to Craig Everett Earl! First guest announcement for Grossfest 2019! Back by popular demand, they need no introduction it is Justin M. Seaman and Zane Hershberger! These guys will hopefully have a few more projects ready for release at the next Grossfest among some other goodies that independent horror fans will enjoy! They like us and we like them so it just makes sense to bring in these very talented filmmakers again. Well Grossfest fans and vendors it is the announcement you have been waiting for… Grossfest 2: The Grossening, The Gross Return, The Gross Revenge, Gross the C.H.U.D., The Devil’s Gross, you get the picture folks. It happens Saturday, July 20, 2019! So yinz start making reservations now and get your vendor tables now. We have a hotel block once again and rooms are $119 plus tax. Also people we didn’t go far from the original location (We like Washington, Pa. and they like us) but bar and restaurant will be open the whole time during the convention, plus the casino is only a short walk away, also for the out-of-towners always interested Primanti’s is a block or so away, plus this location is about a ½ mile from the exit off of I-79 and about a half mile or so from Route 19. Once again we will have a great vendor room and movie room. But even better news people tickets are still only $10 for admission and vendor tables are still $50 each. VENDORS DON’T HESITATE to get your space. We sold out for our first show! One more thing… filmmakers we are having the Independent movie room again and Grossfest awards will be given out for ‘Best Feature’ and ‘Best Short Film’. So get your submission in. In order for your film to be even considered “WE NEED A PHYSICAL COPY”! There is no cost for the submissions just get us your DVD to be eligible! Just contact one of us (Tom, Terrence, Tammy, Jen, or me) to get details where to send your DVD. 3 Rivers Comicon, hosted by New Dimension Comics, has commissioned a custom beer by Helltown Brewing featuring original bottle label art from Witchblade and will host a bottle release party on May 19, 2018 . The exclusive beer will be brewed by Helltown Brewing, based in Mt. Pleasant, PA. Witchblade Barrel Aged Russian Imperial Stout with be brewed with coffee added this year. “For the last 2 years, Helltown made a secret, small batch coffee variant for our beer release party during the convention. “ says McDevitt. “Barrel aged coffee beers are my personal favorite and I wanted to share my joy with everyone this year. Helltown is my choice to create this custom brew for the 3rd year because they do such great, delicious work!” This beer will only be made exclusively for 3 Rivers Comicon and New Dimension Comics. May 19th at 7:00 is the bottle release party at 3 Rivers Comicon in West Mifflin. Top Cow President Matt Hawkins and artist Joe Jusko, will be on hand to autograph bottles. Tickets at $39.99 include weekend admission to 3 Rivers Comicon, catered food, and free samples of the custom beer. Or, fans can catch up with previous years bottles with the Triple VIP ticket for 69.99 and go home with a bottle from all 3 years. 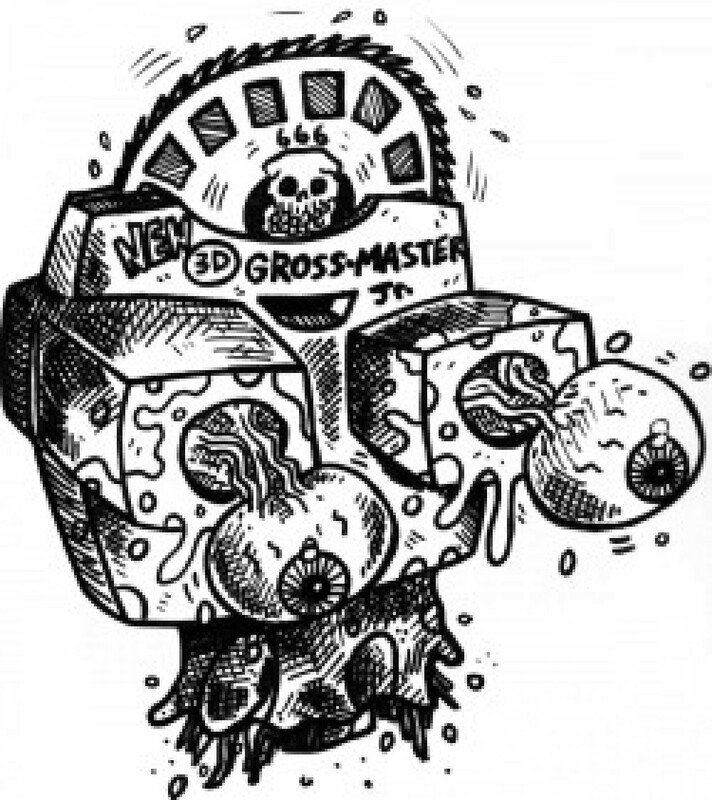 A little less than six months to go till… GROSSFEST! The goal of Grossfest isn’t just to have fun but to do a film festival, convention, whatever you wanna call it a little bit different. Grossfest is not here to compete with the local Steel City Con, Living Dead Festival, or even Horror Realm at The Hollywood Theater. Grossfest is an idea that yes, started off as a joke but was always an idea of something that I have always wanted to do. It’s an idea that has been rolling around in my head for many years. Hell, some of the people who got to see the Bastards of Horror film festival years ago at Horror Realm knew I always would like to do something like this. The point of this idea is to have an event once a year with help that will cater to independent filmmakers, independent actors, their films, independent authors, and celebrate them. Give them another platform to show off their work! Instead of the Indy people being only a small part of the event how about make them the biggest and best part of the event? By some chance the event isn’t successful a really cool person, Tim Wilder (R.I.P.) said to me, “Order pizza and turn it into a party. All of our friends will be there anyway and there will be awesome movies!” And that I can never argue. All are welcome to the Grossfest event and if you have questions or want more details about the hotel go to www.grossfest.com or the Grossfest Facebook group page. Otherwise I will see yinz all in less than six months on July 28th, 2018 at The George Washington Hotel in Washington, Pa.
P.S. Thank you to the people who are taking a chance and standing behind this event and putting their time and money into it.